Gold Bar Park Loop Trail is a 1.8 kilometer moderately trafficked loop trail located near Sherwood Park, Alberta, Canada that features beautiful wild flowers and is good for all skill levels. The trail offers a number of activity options and is best used from March until October. Dogs are also able to use this trail. Gold Bar Park was created in September 24, 1973, and its main industrial tenant is the Gold Bar Wastewater Treatment Plant. The Gold Bar Wastewater Treatment Plant handles the wastewater requirements for over 820,000 people in the greater Edmonton area. It is a world class facility yet it manages to co-exsist well with the Park surrounding its boundaries. To the north of Gold Bar park, is Gold Stick Park which contains a number of sports fields that are used extensively by the surrounding communities. There is a small trail that connects the two parks just north of the Ainsworth Dyer Pedestrian Bridge. Entering the park from the Ainsworth Dyer Pedestrian Bridge, you immediately enter a much quieter, calmer green space. Gold Bar Park has a nice paved trail system which loops around a few man made lakes. There are over 30 picnic areas scattered throughout the park and plenty of open areas for kids to play in. There is also a pavilion with washrooms, a fountain and a phone. There are a large number of birds, geese and ducks that make this park home and provide plenty of viewing pleasure from the lookouts on the mini-lakes. This walk is all paved with gentle elevation changes. A good walk for everyone. There are a few much larger picnic areas available as well. There are over 30 picnic areas in Gold Bar Park. Picnic spot nestled in the trees. Here is a pleasant stop and a lookout over a man made lake. Lots of picnic areas nearby. 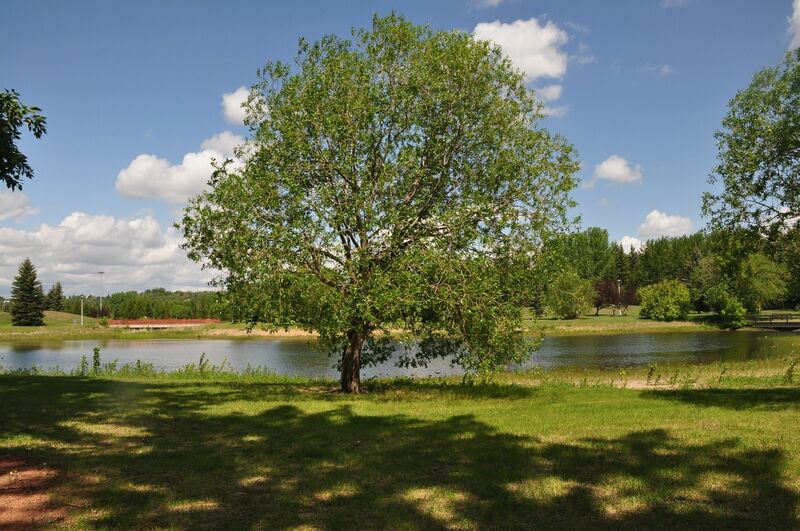 Many different varieties of trees live within Gold Bar Park. The paved trails are in excellent repair and are heavily used by walkers, joggers and bikers. The pavilion has washroom facilities. There is a second, larger man made lake in Gold Bar Park with a small island in it. A variety of birds call it home. To the right of this spot is a Pavilion with a washroom. A City of Edmonton Emergency Phone. -There is parking available if you enter from the City side, by the wastewater plant on 50th Street. -There is an emergency phone located by the main picnic area by the public building. - Easy, gentle walk for all people -Bring a lunch!